On Monday evening, D.C. Mayor Muriel Bowser delivered her annual “State of the District Address,” marking the first time she has done so during her second term. She sailed to re-election last year without confronting a serious challenger in the 2018 Democratic primary. With regard to transportation issues the Mayor insisted that getting DC residents to ride the Metro is essential and strengthening Metro remains a priority for the mayor. “As much as we love the Circulator, Streetcar, and Capital Bikeshare, we also know that they are no replacement for Metro,” Bowser said. She called, as she has done recently, for a commitment from the transit agency to return to late-night service, and also warned against Metro “becom[ing] a system that only caters to white-collar workers commuting from the suburbs.” “We’re not going to replace Metro with Uber and Lyft,” Bowser said, “because we can’t move our region forward by further clogging our roads.” Metro is currently planning to offer subsidies to ride-hailing and taxi companies that could give late-night rides to workers. Such comments are hypocritical upon consideration that her administration has allowed an unlimited number of Uber vehicles in the City. While DFHV has over-regulated the locally owned, small business taxicab companies, the City has placed no limits on the quantity of private vehicle for hire vehicles allowed to operate on DC streets. While there are only an estimated 5,500 taxicabs in DC, according to the latest DFHV newsletter, there are at least 178,000 Uber and Lyft vehicles clogging the streets. Bowser also announced that from now on, the red D.C. Circulator buses will remain free, as they have been since February. The mayor said in recent weeks, workers had waylaid her to praise the free bus service. “We may not think about it, because it’s just $1 each way, $2 a day, but for a working person it adds up,” Bowser noted. She mentioned nothing about her administration’s failure to address the City’s widespread pothole problems. Pothole complaints to the city are about three times higher now than they were last year. Maryland Gov. Larry Hogan has seen the reports about the alarming condition of the Baltimore-Washington Parkway, and he slammed the federal government this week for the situation, according to a report. NPS says they have a five-year annual funding gap of around $50 million, according to the report. NPS told Fox 5 in a statement it would attempt to repave a section of the BW Parkway near the Prince George's County border this fall. Stop-sign cameras in the nation’s capital have issued more than 53,000 citations to drivers for a total of $2.6 million in fines this fiscal year, according to AAA Mid-Atlantic. The cameras in D.C. are used to capture drivers who roll through or fail to come to a complete stop signs at nine intersections. The fine for this violation is $50. The District first deployed stop-sign cameras in Aug. 2013 and became the first major city in the country to do so. The amount of tickets and fines issued in 2018 is a dramatic increase compared to five years ago. AAA Mid-Atlantic says the stop-sign cameras only caught 6,863 drivers while collecting only $288,461 in revenue from the fines during the first phase of deployment. The city’s Chief Financial Officer cited delayed implementation and glitches for the low number of citations and revenue during the first few years after the stop-sign cameras were deployed. "Although such violations are far too common, stop sign-running incidents can prove fatal in intersections with stop signs in place, especially when one driver, or more, fail to obey a traffic control device," said John Townsend II of AAA Mid-Atlantic. "Stop means stop! Yet, 'two-thirds of stop sign crashes occurred when drivers actually stopped for the sign, but failed to yield to oncoming traffic.' Drivers can miss seeing stop signs, pedestrians, and other vehicles for a host of reasons, including distractions, pitch darkness, diminished traffic sign conspicuity, glare, or trees. To save lives and avoid tickets, simply observe the 'three-second rule' or 'two-second rule' at all stop signs." Townsend says drivers should follow a two to three-second rule when they encounter these cameras and make sure to completely stop at the intersection for that length of time before moving on. A city contractor in Washington has pleaded guilty to bribing public officials at two D.C. agencies, and prosecutors say the businessman interfered with a “wider corruption investigation,” according to recently unsealed court documents. Emad Hajhassan, the owner of a D.C. tow truck business, was sentenced earlier this year to 16 months in prison for paying nearly $50,000 to city officials at the Department of Public Works and the D.C. Taxicab Commission (now the Department of For-Hire Vehicles) in exchange for towing and impoundment assignments for his company. “The defendant corrupted two city agencies, interfered with rule-following business owners’ ability to compete fairly for city contracts, and undermined confidence in the integrity of city contracting,” federal prosecutors said in sentencing documents unsealed late last month. After Hajhassan of Alexandria initially pleaded guilty in 2014, prosecutors said he paid off a third official with about $13,000 in cash to maintain an exclusive towing contract in violation of his plea agreement and to the detriment of a law enforcement investigation. “He then lied to the FBI about that scheme, falsely claimed that his corruption was motivated by fear not greed, and inhibited the government from holding corrupt officials accountable for their crimes,” prosecutors said in the filing. Hajhassan is listed in court records as the owner of Able Towing, on Adams Mill Road in Northwest, one of nearly two dozen private companies the city relied on at the time for towing jobs. Cheh, whose committee oversees the Department of Public Works, said she would wait for more details of the investigation — including whether indictments are filed against other District employees referenced in the Hajhassan case — before deciding whether her committee needs to hold a hearing into the potential for wider problems at the agency. “The more airing out of this stuff, the better,” she said. Officials at the Department of For-Hire Vehicles and the administration of Mayor Muriel E. Bowser (D) did not immediately respond to requests for comment. Hajhassan’s attorneys did not immediately respond Monday to messages seeking comment. In court filings, his lawyers asked for a sentence of probation and noted that his cooperation led to the conviction in 2016 of Vernita M. Greenfield, a D.C. government dispatcher who handled tow truck orders. Greenfield, who pleaded guilty to one count of federal bribery, was paid $200 to $500 in weekly installments for steering towing orders to Hajhassan’s company from 2011 through 2013, court documents stated. Hajhassan’s lawyers said he separately got involved with a government supervisor who controlled several tow truck contracts within Public Works because he feared the consequences of not cooperating with the supervisor. “Hajhassan believed that if he refused this supervisor’s requests that the supervisor would retaliate through either physical violence or financial damage to his business,” according to the court filings first reported Monday by the Program on Extremism at George Washington University. The documents do not name the supervisor or another official identified as a public vehicle inspector with the cab commission. Hajhassan admitted in his plea deal to paying $400 in cash each month to the inspector to steer about 80 percent of assignments to tow and impound taxicabs that were in violation of city regulations. Prosecutors had recommended a prison sentence of 33 to 41 months for Hajhassan. U.S. District Judge Paul L. Friedman in January sentenced him to 16 months for each of two counts of bribing a public official, to be served concurrently. Uber will pay $20 million to its drivers in California and Massachusetts to settle a class-action lawsuit that raised the question of what responsibility the company has to its workers. Lawyers for Uber said in a court filing March 12 that they had agreed to a settlement with thousands of drivers. U.S. District Judge Edward Chen is set to hear the two sides’ motion on the preliminary settlement on March 21 in his San Francisco courtroom. Ultimately he will decide whether the settlement can go forward. While the deal won’t end the longstanding and thorny question of whether Uber’s drivers are employees or contractors, the settlement likely will resolve the lawsuit that has forcefully pushed this question into court. Maryland's statewide speed camera program has fallen once again into the crosshairs of government auditors. The General Assembly's Office of Legislative Audits last week released the result of its examination of the books for the highly profitable state's highway "work zone" speed camera program. Auditors for a second time found significant problems in the $28,550,756 deal it struck with the for-profit company that operates every aspect of the photo ticketing program. In 2012, the auditor found the state essentially rigged the contract bidding process to ensure the highly connected photo ticketing firm ACS, which was acquired by Xerox and is now operating as Conduent, would land the contract (read 2012 audit report). The review of the new contract signed in 2015 revealed that the State Highway Administration has been letting Conduent do whatever it pleased without any oversight. "SHA did not adequately monitor the Maryland SafeZones program vendor to ensure that the program was properly administered in compliance with all contract requirements," the audit report explained. "The contract contains certain vendor requirements, most of which are intended to ensure program compliance in accordance with state law and are necessary for the valid issuance of a citation when a speeding violation is detected." For example, the law requires the use of warning signs with the speed cameras. Conduent was supposed to document its compliance daily at each ticketing location. The State Highway Administration never bothered reviewing these documents, and on-site inspections were not systematic. The state also failed to verify whether the speed camera van drivers had points on their license. Conduent failed to perform the regular checks it had promised to do, verifying compliance for only one out of three drivers. The deal with Conduent expires at the end of 2020, but it can be extended for another two years bringing the company a grand total of $40,313,728 in revenue. The state selected Conduent over two other vendors, Brekford and Redflex Traffic Systems of Australia, even though they would have charged $6 million less. In justifying the contract award decisions, officials pointed to the superior understanding of the contract requirements and the law demonstrated by Conduent. The review covered State Highway Administration functions between August 7, 2014, and June 30, 2017, and was conducted to assist lawmakers in their oversight of the agency. In its response to the auditors, the State Highway Administration accepted all of the recommendations, and promised to conduct more inspections of the speed camera vendors. The agency also agreed to conduct full background checks on speed camera van drivers. From January 1, 2016, through June 30, 2017 Conduent issued 354,000 tickets worth $14.2 million. A copy of the audit is available in a 400k PDF file at the source link below. Parking ticket and towing revenue collected through the Department of Public Works is on the decline in D.C., continuing a trend of fewer tickets going back about a decade. While the District collected about $75 million in parking tickets and towing fees in the 2016 and 2017 budget years, that dropped to $69.4 million in the 2018 budget year ending Sept. 30. In the first four months of the current budget year, from Oct. 1, 2018 to Jan. 30, 2019, the city has collected $21 million in parking tickets and fees, which would set a pace for another decline this fiscal year. Parking tickets make up by far the largest part of that revenue, according to responses to oversight questions from the D.C. Council. So far this budget year, DPW has issued 389,009 parking-related tickets. In each of the full 2017 and 2018 budget years, the department issued more than 1.3 million tickets. The DPW web portal on paying parking tickets had 79,379 page views from Oct. 1, 2017 through Sept. 30, 2018 — second only to the page with the residential trash and recycling collection schedule. DPW’s 244 parking enforcement officers and 6 booters enforce parking rules, while police are separately responsible for enforcing moving violations, such as speeding or running red lights. The moving violations are not included in this data. The most common tickets are for failure to pay for parking or expired parking meters, followed by violations of residential parking rules or other parking signs. Other common tickets include failure to have current license plates, warnings to out-of-state vehicles parked in the city overnight and violations of “No Standing Anytime” signs. In past years, violation of parking rules for street cleaning have also been common tickets, but those tickets are more applicable over the spring and summer, when the rules are in effect across the city. Some of the least-common tickets issued this year include one for a forged visitor parking pass, one for blocking a bus stop during rush hour, two for excessive idling and one for blocking one of D.C.’s few bus lanes. DPW issued eight bus lane citations in the 2018 budget year and 21 in the 2017 budget year. There have been 201 tickets written in the last few months for parking on the sidewalk, 181 for parking in a median, 155 for parking in a car share space, 61 for leaving a motor running unattended, 24 for failing to parallel park, and 15 for parking in electric vehicle spaces. DPW issued 211 tickets for blocking the DC Streetcar and 11 for blocking a streetcar platform. Still, in its responses to the D.C. Council’s Committee on Transportation and the Environment, DPW said it is addressing complaints about under-enforcement of parking in certain neighborhoods. The department has officers assigned to geographic areas, but also responds to complaints about violations that are submitted by the public. Some of those include regular complaints about cars and trucks stopped in bike lanes. The number of tickets for blocking bike lanes has been declining significantly though. In the 2017 budget year, 3,218 citations were written for blocking bike lanes. That dropped to 1,723 in the 2018 budget year. The number of cars booted in the District has declined significantly since 2017 when 9,292 cars had the punishment slapped on. In the last full budget year, 4,301 cars were booted. In the first few months of this budget year, 196 cars were booted. Drivers on D.C. roads racked up $324 million in tickets last year, and Maryland drivers ended the year with the most money unpaid. Between Sept. 30, 2017 and Sept. 30, 2018, more than 1 million tickets were issued in the District through speed and red light cameras. About 33,000 of them were dismissed after a challenge. The D.C. Department of Motor Vehicles processed a total of 2,719,600 citations in the 2018 budget for speed and red light camera tickets, moving violations and parking tickets, according to oversight responses provided to the D.C. Council ahead of a Thursday hearing. That is a slight increase from the preceding year, when the value of processed citations was $306,712,186. In the first four months of the current budget year — October through January — the DMV processed 901,881 citations worth $99,758,342. Of that, $41,068,367 was collected before the tickets were sent to collections, where $9,548 have been collected. As of the end of January, $56,800,374 remained outstanding. In the full year that ended Sept. 30, the department collected $156,072,848 before tickets were sent to collections where $35,174,148 was collected, but $139,281,885 remained unpaid. Overall, D.C. residents had $28,615,543 in outstanding tickets from the 2018 fiscal year. Virginia residents owed $31,512,322. Maryland residents owed $59,662,386. People with cars registered in other states owed $19,491,634. Maryland residents had, by far, the largest value of unpaid tickets in the previous budget year and again so far in the current budget year. The fines double for nearly half of all parking tickets, since fewer than 60 percent of drivers pay those tickets or challenge them within the first 30 days. About 85 percent of drivers pay or challenge the ticket within 60 days. “DMV believes the current process is more than adequate for customers to be aware of receiving parking tickets,” the responses to the Committee on Transportation and the Environment said. Drivers can sign up to get emails or texts when their cars gets tickets and when the car might be booted. In the last full budget year, 160,625 drivers challenged their tickets. At least 54,928, or about one in three, were successful. There were 75,371 cases still pending at the end of September. The most common reason a ticket was dismissed was not due to an appeal, but because the District writes off any unpaid tickets that are more than 15 years old. The image used for a photo enforcement ticket was poor (6,903). The number of tickets successfully challenged with proof of parking payment appears to be rising this budget year, with 5,742 dismissed on those grounds in the first four months. Thousands of tickets are written off each year because they are submitted for processing too late. That does not include about 72,000 tickets that had adjudication requests pending for months until those requests were discovered floating in the ether in June and were only then added to hearing dockets. At the same time, the city is considering upgrades to its 24-year-old ticket administration system and similar upgrades to its 17-year-old driver’s license record system. The D.C. Department of Motor Vehicles has reinstated nearly 66,000 people’s licenses, after previously revoking them for failing to pay certain traffic fines or failing to show up in court for a moving violation, according to a DMV report released earlier this month. The reinstatements come as the result of a new law which prevents the District from suspending licenses for failure to pay fines. The Washington Post was the first to cover the DMV’s new report and the number of District residents who have licenses again. A total of 65,922 people had their licenses or driving privileges reinstated in November 2018, according to the report. Of those, 15,521 were D.C. residents, while 54,401 were non-D.C. residents. The DMV has notified people whose licenses were reinstated by letter, the report says. But only 14,324 letters actually got sent, because so many of the suspensions were decades old. The DMV isn’t tracking returned mail on the notification letters it sent out, the report says. The city still suspends some licenses due to unpaid fines—according to the report, 2,282 people have their licenses suspended as a result of “unpaid judgment[s] from D.C. Superior Court.” But yet another law, signed by Mayor Muriel Bowser in January, has prohibited that, too. The District issued almost a million speed-camera tickets last year, according to data released Wednesday, cementing the city’s regional reputation as a “speed trap” for residents and visiting motorists alike. The number of tickets — which led to $99.2 million in revenue for the city — was nearly double that issued the previous year, according to AAA’s Mid-Atlantic chapter, which obtained the figures through a public-records request to the District’s Department of Motor Vehicles. The District’s citations also far exceeded those in neighboring jurisdictions, according to the data collected by AAA. 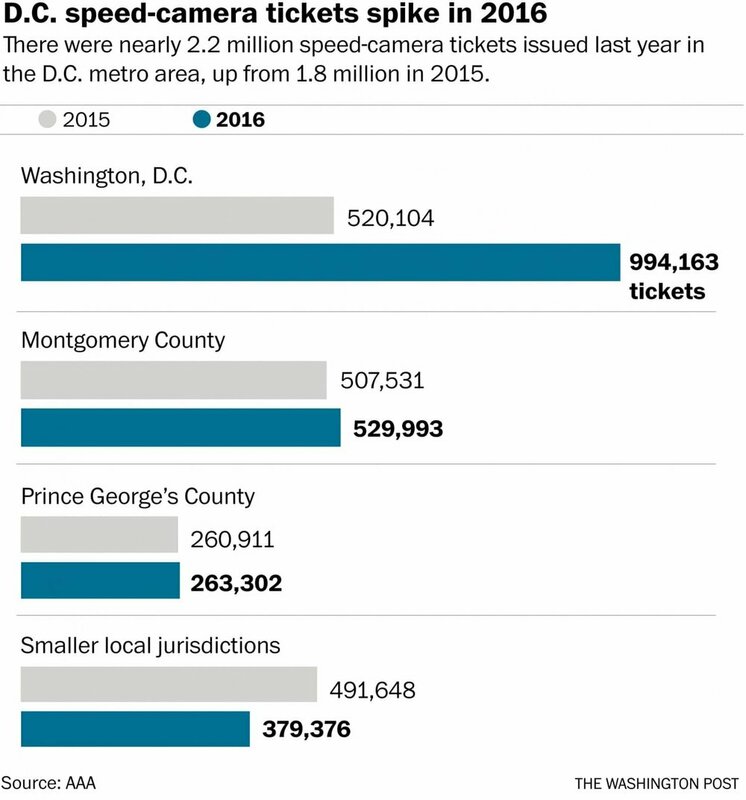 The District issued 994,163 speed-camera tickets, compared to 529,993 in Montgomery County and 263,302 in Prince George’s County. Virginia is prevented by state law from using speed cameras. A D.C. police spokeswoman said the department could not independently confirm AAA’s figures. The dramatic increase could revive debate about the cameras, which have caused controversy in many cities across the country where they have been set up. In the District, being caught by a camera results in a ticket that can range from $50 to $300, depending on speed. Research has shown that the presence of speed cameras leads to safer driving. But many motorists have mixed feelings about them, and some have argued that their true purpose is to serve as a cash cow for the governments that use them. However, Townsend said he had no proof that the cameras had been set up with anything other than public safety in mind and said the purpose of AAA’s publication of the figures was merely to warn motorists that they should obey speed laws — especially in the District. “This was more to let people know, and not to call for a policy change,” Townsend said. Starting next month, drivers in Miami will no longer have to hold their breath when passing under a yellow light, now that the city council has voted to end its red-light-camera program. In last year’s elections, Francis Suarez, the successful candidate for mayor, made a campaign promise to cancel the city’s 2010 contract with American Traffic Solutions, arguing that the cameras hurt residents with excessively high fines but didn’t make the roads any safer. Other localities would be wise to follow Miami’s lead and scrap their cameras. Red-light cameras are touted by their promoters –– predominantly camera manufacturers and law-enforcement agencies, which profit from them –– as a way to make America’s roads safer. For local officials, it sounds like a win-win: More money for the government and safer streets for everyone. But the data tell a different story: These cameras have actually led to an increase in motor-vehicle accidents in many cities, since drivers either speed up or slam on the brakes at yellow lights, hoping to avoid a ticket. A 2016 report from the Florida Department of Highway Safety and Motor Vehicles found that intersections with red-light cameras saw increases in nearly every type of accident in the years since the cameras were installed. Rear-end crashes went up 11.41 percent, angle crashes went up 6.42 percent, and crashes involving injuries went up 9.34 percent. Fatalities from accidents doubled. Similar trends can be seen across the nation. Cities including Los Angeles, Chicago, Philadelphia, and Washington, D.C., have all seen increases in crashes at intersections where red-light cameras have been installed. In Los Angeles, the number of accidents increased at 20 of the 32 camera-equipped intersections. Three other intersections saw accident numbers remain the same, and only nine saw a decrease. Sometimes the cameras help reduce one type of accident but increase another. In Chicago, the city with the most red-light cameras, the cameras may have lowered the number of T-bone (broadside) collisions by 15 percent, but the number of injury-causing rear-end accidents went up by 22 percent. One could argue that T-bone collisions are often more dangerous than rear-end crashes, but the most recent data from Illinois’s Department of Transportation show an increase in traffic fatalities in Cook County, which contains Chicago, despite the ubiquity of these cameras. Cities should instead consider stationing law-enforcement officers near dangerous intersections and allow them the discretion to pull over those who are truly driving in a dangerous manner, instead of simply ticketing every driver who has the misfortune of passing under a light as it turns from yellow to red. If someone does run a red light and cause an accident, witnesses can corroborate the story and proper charges can be brought. Some cities have gotten especially carried away with their revenue-raising ambitions. In Chicago, officials were caught speeding up yellow lights so they would turn red quicker than the city’s minimum of three seconds. That led to 77,000 additional tickets’ being written in 2014, creating $8 million in new revenue for the city. If it weren’t for inquiries from the Chicago Tribune and Inspector General Joseph Ferguson, citizens in the Windy City would have had no idea that this abuse was taking place. The sketchy dealings of red-light-camera companies are not unique to Chicago. In Columbus, Ohio, the CEO of RedFlex, the city’s red-light-camera vendor, was charged with bribing city officials in exchange for a contract. Similar actions have reportedly taken place in 13 states throughout the U.S. If the goal of red-light cameras is to make roads safer, they’ve been a complete and utter failure. All these cameras are good for is extorting money out of drivers without making the streets any safer. A major computer glitch has impacted 70,000 speed camera tickets issued to drivers. Roughly 1,900 of the 70,000 tickets should have been dismissed, but the DC Department of Motor Vehicles sent 1,773 of the tickets to collections. The following statement is attributed to a DMV spokesperson from January 23, 2018. In June, our ticket processing vendor determined approximately 70,000 tickets submitted on-line for adjudication and suspended for mail adjudication were not properly processed. A recent programming change resulted in these tickets not being pushed to the workflow queues for hearing examiners to review and decide. Once the issue was discovered, these tickets were pushed to the hearing examiners’ queues to review and decide. DC DMV regulations require us to answer a Request for Reconsideration within 180 days or dismiss the ticket. The vendor identified the requests for reconsideration that were more than 180 days (approx 1,700), and they were administratively dismissed by DMV. A letter was sent to customers informing them of this legal requirement, the dismissal of the ticket and that they were not required to do anything further.